The Newry Council’s ‘Respect Project’ trip to England was said to have been a huge success. The group spent three days midweek wherein they travelled to England took a guided tour of Manchester United, attended a Championship game as guest of honors and then got the opportunity to welcome the players onto the pitch at the Premier League game Stoke -v- Everton among many more activities. The trip began very early on Tuesday morning with the group collected at 5.30am in Newry, before heading to DublinPort to take the short trip across the Irish sea. In Old Trafford they first had lunch in the Red Café before taking a guided tour of the historic stadium. Later that evening, after checking into the Hotel Britannia, they left for Bolton Wanderer’s Macron Stadium wherein The Trotters hosted Reading in a prime Championship clash. Luckily for the group, they were selected as flag bearers for the game. The game was reportedly played at an electric pace, with Jamie Mackie equalising in the 90th minute, following Eidur Gudjohnsen’s goal earlier in the 2nd half. The next day comprises of more memorable activities; firstly a guided tour of the National Football Museum and then onto the Platt Lane Complex to listen to some elite Manchester City coaches. The whirlwind trip was unrelenting fun; next the group were part of a training session with StokeCity coaches, followed by going to The Britannia Stadium to watch The Potters host Everton in an exciting Premier League clash. 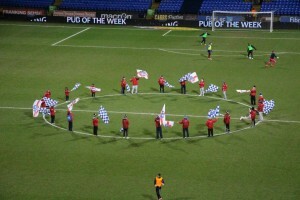 Once again the group were given the exciting responsibility of flag bearers. The match itself was another exciting Premier League game with the hosts winning 2-0 thanks to goals from Victor Moses and Mame Diouf. The day ended late once again, arriving back to the Hotel Britannia and 11pm. Nevertheless it was an early rise on Thursday with breakfast scheduled for 7am. The group then travelled to Holyhead and got some lunch before crossing The Irish Sea to end their memorable trip. For more information on such events as the Respect Project keep an eye on the blog here.